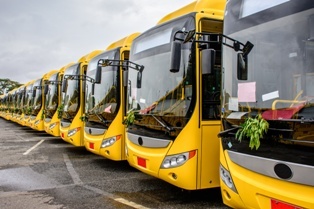 Insurance to Cover Hail Damage to Shuttle and Bus Services | The Voss Law Firm, P.C. Hail damage is a constant risk for commercial vehicles, as even a brief storm can shatter windshields and dent bodywork. While these claims can cause minor setbacks for businesses with one or two vehicles, companies that rely on an entire fleet for daily operations will need specialized and comprehensive coverage to stay afloat. Attorney Bill Voss takes a look at the hail damage insurance options for owners of shuttle, bus, and taxi companies, and examines coverage endorsements that can make it easier to recover. Most commercial vehicle owners have property damage coverage and liability coverage to protect them after a collision. However, this form of property damage does not apply to damages caused by a non-crash event, such as a hailstorm. Owners will have to select additional forms of insurance that will cover weather-related damage, as well as replace the income that will be lost as a result of extended repair times. Selecting comprehensive physical damage insurance. Comprehensive damage insurance covers losses caused by an event other than a collision, including severe weather, theft, fires, or vandalism. If a comprehensive policy is cost-prohibitive, owners may also add hail and weather damage as a “specified peril” on their insurance policies, giving them control over which events will and will not be covered. Investing in rental insurance. It may be necessary to keep damaged vehicles after a hail storm rather than perform immediate repairs, since insurers may want to inspect the damage on each vehicle before paying the claim. Rental insurance allows you to continue serving your customers with alternative forms of transportation while your claim is processing. Opting for towing coverage. The costs of towing a single vehicle may be minimal, but it can increase rapidly if the entire fleet is damaged. Towing insurance pays for the expense of towing damaged vehicles to a repair location or a storage facility until repairs can be properly assessed. Insuring all vehicle accessories. Transport companies often rely on in-vehicle technology, such as satellite navigation systems, mileage meters, dispatcher radios, and even video screens for passenger entertainment. An accessories enhancement to your coverage can cover the considerable cost of any expensive devices installed or mounted inside the vehicle. Increasing business income coverage. If several vehicles have been damaged, you may suffer lost profits as your customers go elsewhere for their transportation needs. You may wish to consider extending your business interruption coverage until your fleet is complete, replacing up to a year’s worth of income. Considering seasonal insurance. If you rely more heavily on your vehicles at a certain time of the year (such as New Year’s Eve or during a summer festival), seasonal insurance can replace lost profits during peak times. In many cases, seasonal insurance can be collected in addition to business income loss, allowing businesses to survive a bad quarter and reopen with all resources intact. Taking weather-preventive measures. Investing in adverse weather precautions can not only lower your premiums, it can reduce the chances of your filing a claim. Common tactics include housing vehicles in a concrete structure with a strong roof, training employees how to respond in a sudden storm, and removing vehicles from surface lots when hail has been forecasted. If you are having trouble getting the full value of your hail damage claim from your insurance company, the Voss Law Firm can investigate the details, examine your policy, and fight on your behalf. Simply fill out the contact form on this page today or order a free copy of our book, Commercial Property Owners Must Read This BEFORE Filing an Insurance Claim.